Indian Wear is just like a canvas of beautiful colors and patterns, which reflects the rich heritage of our nation. Kalkifashion.com offers Wedding Sarees, Salwar Kameez, Anarkali Suits and other variety to meet varied preferences and personalities of our clients. Each item available in our collection is creatively designed and made by the most talented team of designers. We have been associated with some of the most prominent figures of fashion industry like Ritu Kumar who is a pioneer in introducing the culture of boutique in India. Our Indian Dresses are considered unique as traditional handwork is done by our experienced craftsmen on some of the finest fabrics to make these. While designing the attires, we pay utmost attention to every minute detailing to ensure that the final output turns out to be flawless and alluring in every sense. Emphasis is given to the quality and look of the Indian Dresses, instead of their quantity. 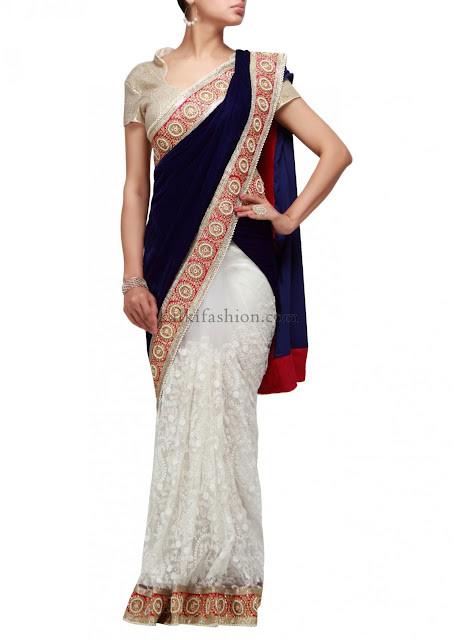 Wedding Sarees designed by us are beautiful in appearance and can be worn in various styles. These sarees are intricately designed in such a manner that they impart them the most attractive appearance to the brides on their special day. We present a collection of ethnic wear, which is beautified with the stunning Bagh embroidery of Punjab, unique Aari work of Kashmir and intricate Zari work of Hyderabad. Our clients can choose the best outfit for themselves from the closet of Kalkifashion.com, which has some of the best outfits in store at the most competitive prices. The Kalki bride is an enigma she’s elegant, exudes an aura like none other, and yet has her sensuality delicately in control. she makes a statement of personal style…confident and bold, poised inside graceful outside. Kalki stands for Eternity, A destination for bridal wear Kalki, caters to the entire needs of a wedding trousseau. From stunning lehenga-cholis, rich ornaments designer sarees Salwar kurtas,to wedding accessories and an incredible range of fabrics, the classic Collection of its timeless and creative ensembles for the bride are versatile and aesthetically appealing. Kalki believes in making special occasions truly memorable and beautiful for the bride With style and panache. Its collection is created by fresh, upcoming talent and its creations are versatile playing on the radiance of the modern day woman. The ensembles have a touch of georgette, chiffon and silk brocades enamoured with everlasting grace and embellishments. white sari and blue pallu!! looks amazing!!! I am a number one fan of Indian designs, styles and patterns. Love the white saree very much. Wow... this indian design is really beautiful!! !